Barcelona has always been on my bucket list because I love the fact that this city offers both cultural life and the beachside location. In April, I found a great deal to Barcelona with Ryanair (only £68 per person return), so my boyfriend and I took the opportunity to visit Barcelona for the first time. I was very excited when we arrived last weekend and our experience could not have been better. It felt like holiday from day one and I enjoyed exploring the city including popular sights such as La Sagrada Familia, Picasso Museum, Olympic Stadium, La Rambla, Hill of Montjuic, Park Guell, La Boqueria market as well as strolling along little side streets, the beach and the gothic quarter. Besides this I fell in love with the food and I have had the best Pina Colada and raspberry ice cream during my stay in Barcelona. This trip made me want to travel more again in the future and I hope that I will do so with my new travel buddy. A more detailed post and photos are coming soon but I thought I’d share my favourite picture. 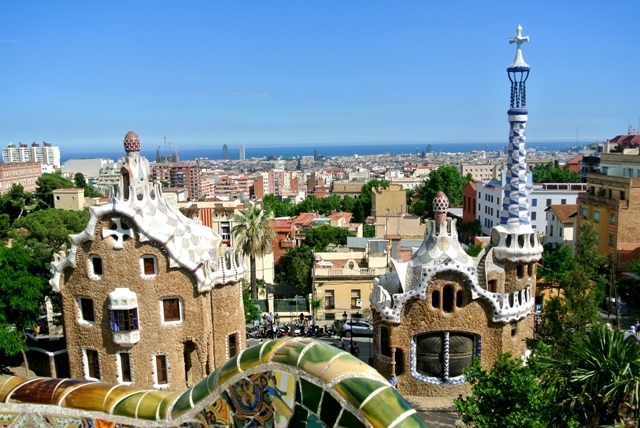 It was taken from Park Guell – a beautiful park with architecture and colourful sculptures influenced by Gaudi. It’s situated on top of a hill and it’s a good 15 minutes walk from the tube station but it’s worth it. The view over Barcelona is spectacular and the Gaudi buildings and flowers made us feel like we’re in a different world.